Vista del Sur’s two Girls on the Run teams participated in a community service project at the Feed my Starving Children organization. Feed my Starving Children prepares meals for malnourished children all over the world which is then delivered by organization partners. The students packed 67 boxes comprised of 14,472 meals. Their efforts will feed 39 children for an entire year. National Junior Hon or Society members held a Virtual Teal Run. 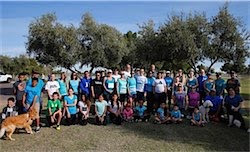 The Teal Run was organized as a way to honor the NJHS President’s mom who was diagnosed in 2014 with Clear Cell ovarian cancer. NJHS raised over $3,000 on Teal is Personal and had “runners” locally and from across the country who went on the run. The run was a huge success and learning experience for the students! The Laveen School District is actively seeking community members to volunteer in our schools. If you are interested in making a difference in the lives of Laveen students please fill out the form and we will contact you. To read more about how the Laveen Elementary School District serves the community, visit the district’s webpage.